Have you thought of buying data directly from your Gtbank account using your Etisalat line? Anyway, it's possible to buy Etisalat data directly from your Gtbank account without using any Mobile app. Guaranty Trust Bank has just introduced new USSD code to make it possible. 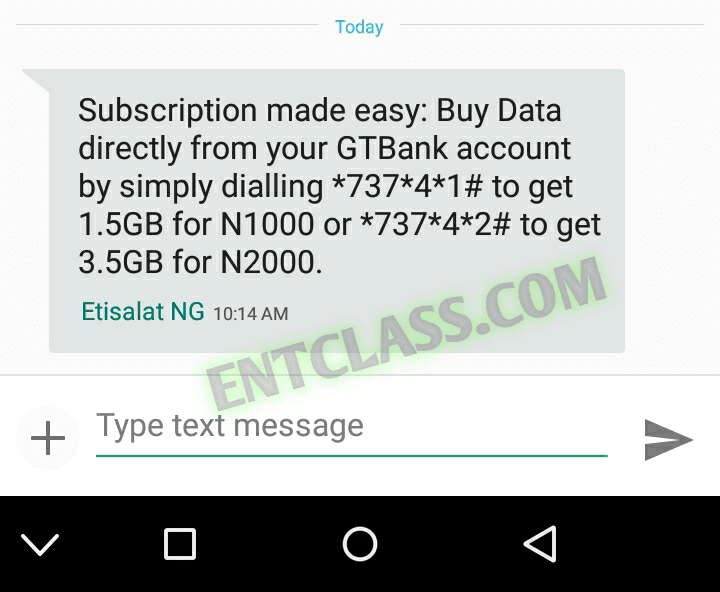 I will be guiding you on how to buy Etisalat data directly from your Gtbank account. This steps doesn't take upto 5mins. The Etisalat phone number you used when opening the account. You don't need internet access to buy the data from your account. Subscription made easy: Buy Data directly from your GTBank account by simply dialling *737*4*1# to get 1.5GB for N1000 or *737*4*2# to get 3.5GB for N2000. 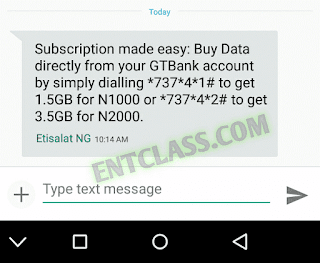 To buy Etisalat 1.5GB data for N1000, simply dial *737*4*1#. To buy Etisalat 3.5GB data for N2000, simply dial *737*4*2#. WHAT IS THE VALIDITY PERIOD OF THE DATA? Both data are valid for 30-days (1 month). You can also get more features by dialing *737# on the phone number that is linked to your Gtbank account. If you have any problem or confused about this post, kindly comment below. If you find it difficult to comment, kindly search Entclass on Google Playstore and download it. Or download it HERE and use it to comment easily. You can also get notified from our Android app of new free browsing tweaks published here. You said 1.5Gb for 1000 naira but is just 1GB that's deposited in my account, why is it so?